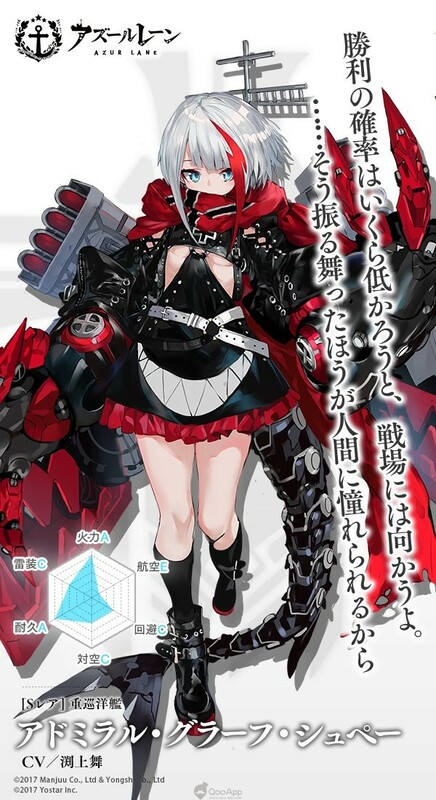 Yostar’s mobile game Azur Lane (アズールレーン) will introduce a new girl, german battleship Admiral Graf Spee (アドミラル・グラーフ・シュペー), after the next maintenance. Admiral Graf Spee is made by Nazi Germany. In the game, she is a SR heavy cruiser. A ship that went through Battle of the River Plate and had an tragic end (sunk intentionally by the Nazi), she has no emotion and considers herself cold blooded. In fact, she yearns for an ordinary life, love and warmth. Her voice actress is Fuchigami Mai. Azur Lane hasn’t announced how Admiral Graf Spee can be acquired, and the date of maintenance is still uncertain.